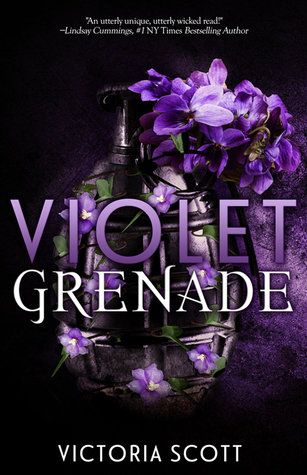 Violet Grenade by Victoria Scott. Entangled Teen, 2017. 300 pages. Well this was an odd one! It's been a while since I finished this book, but for some reason I'm still not entirely sure how I feel about it. Violet Grenade was very similar to its title - it felt like an explosion of a story that was sort of thrown out there and left for us, the readers, to pick up the pieces. Every concept in this story appealed to me, but I'd say the execution was maybe at a B+ on the grading scale. This felt like it wasn't quite ready for reading, like it had been quickly pulled together. Part of me really did like this book, but part of me also found it lacking... something. It was entertaining, but it just felt somewhat haphazard and almost rushed. Domino was an odd character. I never really felt connected to her, despite this story being told in her first person narration. There was just some sort of disconnect that made it feel like I was watching this all from a great distance. I just felt that her character was inconsistent. In a way, that seems to fit with the notion of her being rather unpredictable, but it just didn't work for me overall. For instance, Domino repeatedly states that she hates to be touched, but every time she made that statement she was being touched by someone (a hug, a hand on the arm, etc.) she was thinking 'oh, this is actually okay,' which just didn't fit. I understood a lot of where her mental instabilities came from, but I feel that that entire aspect just wasn't developed as well as it could have been. Then there's this 'Wilson' figure, and I just don't know what to say about him. I really started to like him more in the middle/latter half of the novel, but I juts didn't really get it, which I know is the point. He is supposed to be this enigmatic, 'other' presence in Domino's mind, but... what? I don't know. The ending confused me, I'll just leave it at that. There is also a lot of girl hate and competition between many of the female characters, and I just became very frustrated by it. I understood the competition between to a point, but some of the extreme events that took place between the girls just didn't seem quite justifiable enough based on what I had read. I also felt like Scott tried really hard to portray schizophrenia/mental illness/PTSD, and although I think that she portrayed it fairly well, I don't think it completely worked out how it was meant to. While these elements were present, they were never really addressed, so I'm not sure what I am supposed to feel after finishing Domino's journey. I am, however, glad to see how much work Scott went to try to portray mental illness in and similar struggles in such a realistic, raw manner. The last thing I want to mention about this book is about the ending. I won't give away any specific details, but I just want to say that I was somewhat disappointed and felt that it was a bit too predictable. Nonetheless, this was a strong story overall and I am giving it three-and-a-half-stars!